Deb's Cup of Tea: I Won What? There was a large box on the front steps last night. I have one more package coming but it's not even remotely as big as this box was. The box has "Hills" on the side, which I recognize as one of the leading providers of prescription and specialty pet food. 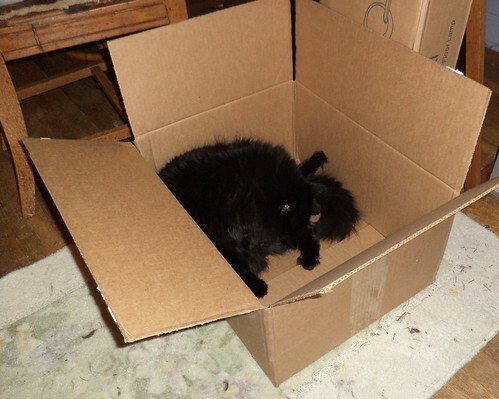 As the box looked fresh, not recycled, I wracked my brain to think what I could have ordered from Hills or from anywhere, that would have come in such a box. Unable to think of anything, I checked the label. Yes, it was addressed to me. Let's see what we have here. Congratulations what? The card reads, "You won a free bag! 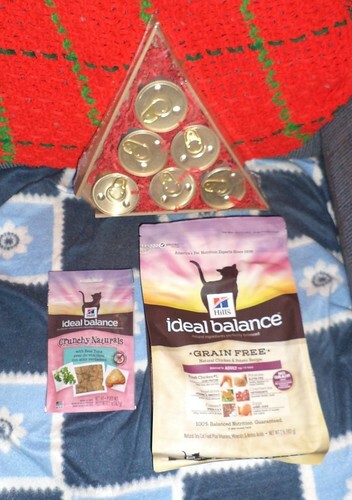 We'd love to hear what you and your cat think about the new Ideal Balance, so give it a try and send us a review at the link below. Feel free to take the opportunity to brag a little by sharing photos or video of your experience." I what? I won a free bag of cat food? The top is a Drinkwell water fountain. I didn't see any cat food. 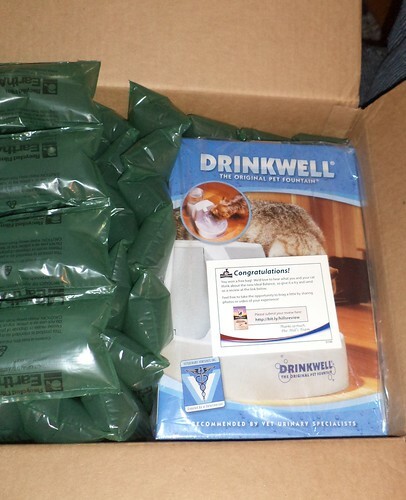 So I pull all the green packaging out to remove the fountain. This is what I found. Cat food; a small bag of dry, a package of treats and 6 cans of wet. Cat food. Sooooo...we will be starting week two of the mystery food for the survey. I have half a bag of that on the kitchen table. I'm not that impressed by it. The girls seem to love it, but I think they eat too much. While I don't feed on demand, I am tracking how often I see the dishes empty. It seems to be a lot, way more than with the Purina or the Merrick. I think that's because there is grain in the ingredients of this food and that is not as nutritionally dense as grainless cat food. They like it so I'll finish off the bag. When the mystery food came, I had a fifth of a 16 pound bag of Purina left. I'll feed them that food to finish it off, then I want to go to the Merrick chicken. I had opened the bag purchased a month ago and was feeding it, sort of half and half, with the Purina. I have a full bag of that. Now I have this bag I won. It's a 2 pound bag so it won't last long when I do open it up to try. Based on this, I don't think I have to buy cat food until January. I still have no idea where they came from. I just don't recall entering a contest with a fountain or food as the prize. I am really not sure about the fountain. If this has any kind of noise, beyond running water, I can see them being scared of it and not going anywhere near it. That kind of defeats the purpose. This isn't something I would have entered to win, so I'm just flummoxed. Oh well, it's a surprise and will, if they like the fountain and the food, enhance their quality of life. Plus, the box was well received.